The CKK sheath/holster molding press is the industry standard in thermoplastic forming presses. Built from rugged ¼ inch steel plate with full black surface coating, this forming press will last a lifetime. It was designed by experts, for experts! We use them in our shop daily! Our professional forming system is perfect for making flat-faced (one sided) or a full fold-over (wrapped style) sheaths and holsters. These are commonly used for securing knives, handguns, web-gear, flashlights, magazine clips, cell phones and many other desired items. Using this unique tool, you can make wraparound sheaths/holsters with both pieces of foam attached (top and bottom). 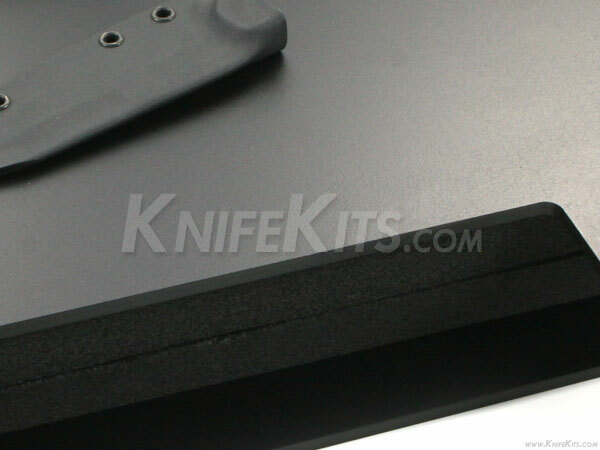 Or you can easily create flat-backed styles by simply slipping a flat, hard surface plate (many use Micarta® or G10) into the molding press and forming one side of the item. You can then use a flat piece of KYDEX®, HOLSTEX®, Boltaron® or leather for the other side of the sheath or holster to complete your project. The top plate on this press is removable for quick height adjustment, making it a very versatile tool. The 12" inch bench model press comes complete with pre-drilled footer holes to accommodate stable production mounting. The top plate has a channel locking system to allow you to lock it down in place using the supplied retention chain. You can then walk away and do other processes while your heated KYDEX®, HOLSTEX® or Boltaron® sheet material is cooling into final form. To use this tool, simply heat your thermoplastic material to 300-375 degrees (depending on heating time and oven used). Then cover or wrap your item with the heated material (see our video tutorials for examples). Once this is done, place the wrapped item in the molding press and apply pressure (chain locking optional). 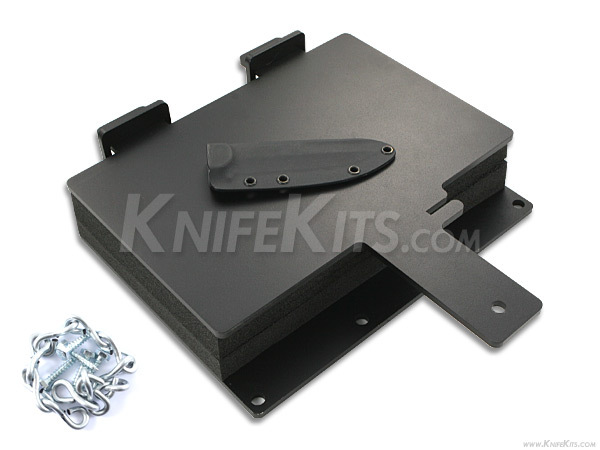 Our molding press will do the work for you and quickly improve the quality of your sheaths and holsters. Say "good-bye" to fumbling with clamps, boards, and loose foam. This press eliminates a clumsy molding process and helps you to create an excellent, professional quality product, quickly and efficiently.